Cleansed skin to your satisfaction with the selected products or your money back! MARCELLE, OFFERING GENTLE AND EFFICIENT PRODUCTS FOR OVER 140 YEARS, HAS YOUR SATISFACTION AT HEART. If after 3 days of use, you are not satisfied with the cleansing action of the Marcelle Makeup Remover, we will reimburse you the amount of your purchase (purchase price of the Marcelle Makeup Remover after any coupons or discounts applied) plus applicable taxes. 3. Mail the completed form together with the dated receipt (the purchase amount of the Product must be identified on the Receipt) at: Groupe Marcelle Inc., Consumer Service, 5600 Côte-de-Liesse, Ville Mont-Royal, Quebec, H4T 4L1. If you are unable to download the form or for any question, contact us by email at [email protected] or by telephone at 1-855-855-9792. ***For the first 1,000 refund submissions only. (each a “Marcelle Makeup Remover”). The Marcelle Makeup Remover must be purchased individually. 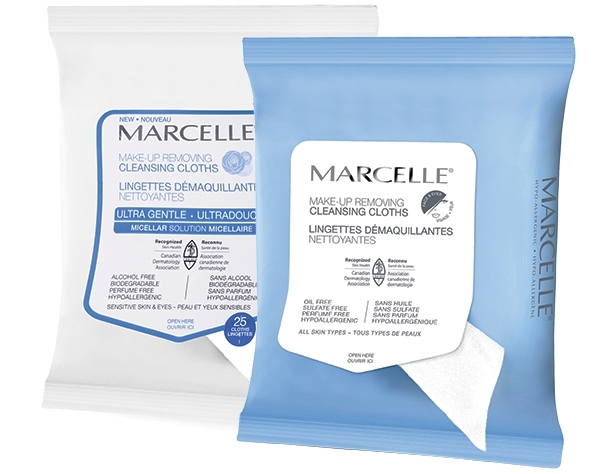 The program does not apply to a Marcelle Makeup Remover which is part of a gift set or sold (packaged) together with any other product. Keep, as the case may be, your original purchase receipt, your order confirmation email or your delivery receipt (the “Receipt”) and follow the instructions below. Limit: one refund for one Marcelle Makeup Remover per person per home address. The program is organized by Groupe Marcelle Inc. and is open only to individuals residing in Canada aged 18 or over. The following persons cannot participate in the program: officers, directors, shareholders, employees, agents and/or representatives of the organizer, its affiliates and/or advertising agencies. The program is limited to the first 1,000 refund submissions. The submissions must be received no earlier than 3 days following the date of purchase and no later than 60 days following the date of the purchase of the Marcelle Makeup Remover. The organizer accepts no liability for damage, loss or delay in transit of refunds. The organizer is not responsible for lost, late, undelivered, invalid, incomplete, misdirected, illegible, or damaged submission, which will be disqualified. The organizer may reject any submission deemed insufficient or non-compliant with this program. If, for any reasons, at the organizer’s sole discretion, the program is not capable of running as planned, the organizer reserves the right, subject to applicable laws and regulations, to cancel, terminate, modify or suspend, in whole or in part, the program. The program is governed according to the laws of Quebec. Send us by mail the completed form accessible here along with your dated receipt (the purchase amount of the Product must be identified on the Receipt) at: Groupe Marcelle Inc., Consumer Service, 5600 Côte-de-Liesse, Ville Mont-Royal, Quebec, H4T 4L1. Only completed forms with the legible and dated Receipt will be honoured. Postage charges are the responsibility of the claimant. Note: Refunds will be made by check only.